You can use the PingPongApp being a member of a Table Tennis Club. The App offers great features like a great full-automated tournament module. An awesome drag and drop teams management and much more. 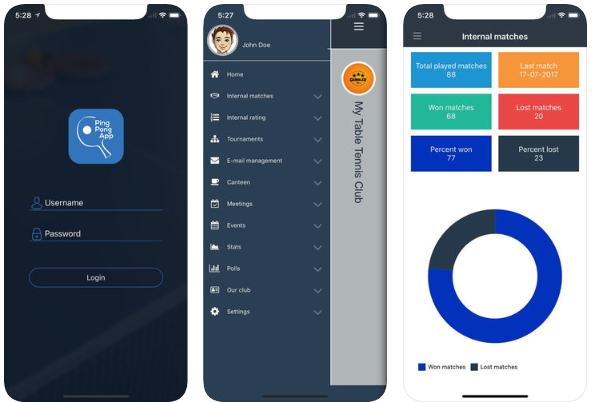 Your club events, meetings and the bar can easily be managed with the PingPongApp. The Internal Matches manager is surely the greatest feature in this app. You can quickly insert all your club matches. The system will show all interesting statistics charts. Members ranking list, active and inactive players, won and lost matches and lot more. You will be able to follow all other player matches within your club and give your comment or start a discussion on every match. Publishing your matches to the bigger social networks will increase your popularity as a player and will help your club to gain new members. The event manager will clearly display all events within your club. It will also offer you the possibility to publish events and make them visible for other clubs according to different criteria like country, language etc. Your canteen or bar schedule will also be visible through the app. The E-mail management offers the possibility to send emails to all club members who wish to receive emails from you. Polls are also implemented in this app which will give your Club admin the opportunity to create a club survey. The member will fill the survey through the app. Contact us and get the PingPongApp system for your club!